Park Shin Hye spotted crying at a school anniversary performance. MBC melodrama 'Heartstrings' starring Park Shin Hye, Jung Yonghwa, Song Chang Ui and more will feature a heartwarming school musical performance today. In tonight's episode, Lee Shin (starring Jung Yonghwa), Lee Gyu Won (starring Park Shin Hye) will join their university schoolmates in a musical performance that involves singing and dancing. The youthful dreams of the young people will unite to present a unique viewing experience to the audience. During the performance, Lee Gyu Won sheds tears. For the first time in her life, she fights for her dreams. Despite the many challenges, she is overwhelmed by the mixture of feelings: the commitment, love, friendship and true happiness. 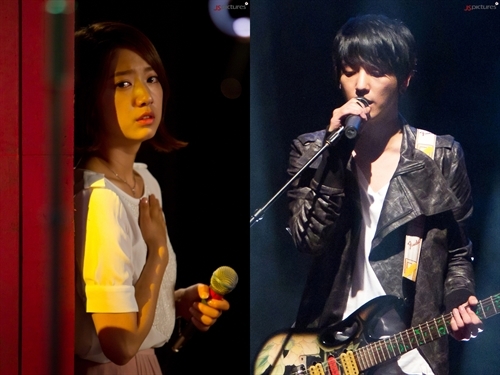 Episode 13 of 'Heartstrings' will air tonight at 9:55pm on MBC. OMG, i cant wait to watch this episode...and time flies very fast...it almost come to the end of the drama...i felt that im gonna miss Yong Hwa and Shin Hye couple...im hoping another drama for both of them...fighting!! Gyu Won-i fighting!! !Love and dreams come true-making real happyness!! !^0^Heartstrings hwaiting! O.o Looking forward to it. Seems really toching >.< Hope nothing bad happens!! I love the ending of this episode but was saddened when I saw HJ singing with GW's voice. Hope they make this song part of the OST because it's awesome and perfectly sang by shin hye. After watching last nights episode I strongly believed that KY's character could have played a bigger role in this drama considering how good of a singer he is not to mention his good looks and what a body!They should have deleted many of the camera time wasted on the dance teacher. He could have been part of the triangle between the leads. Ok no more dwelling on the past. I also thought I was going to see Shin Hyes dancing skill in this episode but to my disappointment it was shown in tiny pieces only and not as part of the celebration at the end and that's really a bummer!! I want to say I can't wait for next week episode but its the last week so I'm sad to even mention this. I will miss seeing shin hye and yong hwa together and of course the other cast too even the 3 witches that I began to like towards the end. I will miss this show since this became my Thursday and Friday morning habit, watching with my breakfast. I can say that not too many kdrama made me feel this way. This show was a pleasure to see and also not bad to the eyes up until now because some shows usually would lose that towards the end but somehow Heartstrings maintains the warmth of every character and the colors you see everywhere is somewhat relaxing to us viewers. I will tremendously miss this drama and I'm hoping that someday shin hye and yong hwa will be together if not in a drama or maybe a musical show because you can't deny that these two have awesome chemistry. Hope Shin Hye will have another drama soon and praying maybe with someone we know who appreciates her acting. i want heartsring to have a art 2 :) me and my mom was create our own part 2 in heartstring. in part 2 we create that Park Shin Hye as Lee Gyu Yuan is the leading lady for the winter holiday and of course the director for the play is Song Chang Ui as Jung Yoon Soo and the composer, leading man is Jung Yung Hwa as Lee Shin. :)) there's a lots of twist in that series. I think almost 20 times i watch heartstring. Its very cool and beautiful TV series. And I think hey are inspired in High School Musical 1,2, and 3 movies. Hope that Heartstring have a Part 2. that Lee gyu yuan win for the leading role and thats is for the winter holiday.